Set up your email account so that your customers will be dispatched the notifications from your marketplace such as registration welcome and verify emails. A good professional practice is to use an email address that matches your site domain name such as; noreply@yourmarketplacedomain.com or admin@yourmarketplacedomain.com that way your customers know the email is coming from your marketplace site. Step 1. 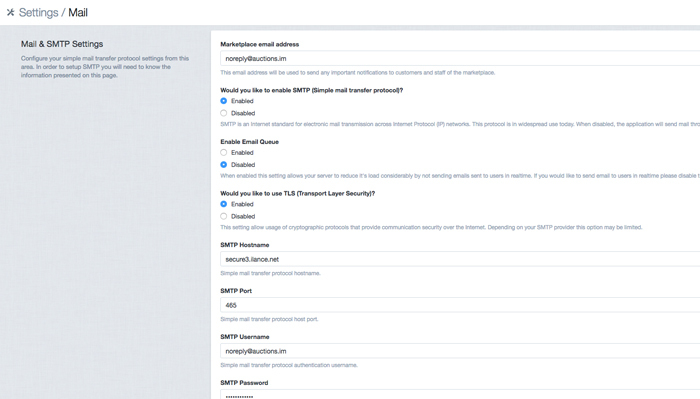 Before installing ILance, have a SMTP mail account set up so it is ready to be used, this address that will be used in the marketplace for sending emails and alerts to customers and needs to be an active working email address. If you host with ILance servers, you will be provided with cpanel access to set up your email accounts.